Wow, Fuego y Agua races… what a ride! Or has often been the case on this journey, lack thereof. I’m finally on a ferry off of Isla de Ometepe a day after originally scheduled. But really, even just writing “scheduled” makes me laugh. Schedules don’t mean a lot here, if they exist at all. This was supposed to be a race recap of the fourth Fuego y Agua races, held on the volcanic island of Isla de Ometepe, on Lake Nicaragua on Saturday, February 16. However, just writing about the race would be an enormous injustice to the event. There was definitely a race here, actually four of them, but as I’ve found is often the case with international racing, racing is such a small part of the experience. Runners started arriving in Moyogalpa, the largest town on Isla de Ometepe, on Tuesday before the race. We were greeted by two towering volcanoes (one of them active), a whole bunch of street dogs, a curiosity as to what a survival runner is, and a week’s worth of exploration. A crew of mostly runners, Nick and Jamil Coury, Ian Sharman, Eric Orton, and I, and accompanied by survival runner Margaret Schlachter, set out on Wednesday to hike the active Volcan Concepcion. While it is true that this is a very big volcano, somehow we just couldn’t seem to get closer to it. We just kept circumnavigating, occasionally seeing race arrows, giving us confidence we were going the right way. After 7.5 flat, hot, and humid miles, we decided we weren’t summiting, so we settled on a 15-plus-mile day instead. The post-hike Coke with real sugar(!) was one of the best Cokes ever. The next day started with a trash clean-up of the town. We learned the island has no trash service, and sadly, because of this, there was trash everywhere. The littered streets are mainly a result of lack of education, but I was excited to see later in the day that this is changing as school children were cleaning the roads. Hopefully this younger generation will help create a cleaner environment. That afternoon, Ian and the Coury’s found the top of Concepcion while I decided to rent a scooter with a couple of the crazy survival runners to check out the island. We first stopped at Ojo de Agua, a natural spring pool about 20k from Moyogalpa. After being hot, sweaty, and sticky since arriving in Nicaragua, swimming in the Ojo was a special treat. Freshly cut coconuts were even being served poolside. After leaving the Ojo, things got interesting as we were flagged down by some cops. They demanded our scooter paperwork and driver’s license… then money. I was okay with one and two, but when they got to three, I tensed up. Were we really getting the crooked-cop treatment? Yes, we were. After trying to calmly negotiate for a few minutes, I realized that was futile and could feel my blood pressure and heart rate noticeably increasing. I finally just grabbed the paperwork and my license from his hand, and then we got on our scooters and left. The cops wanted 20 Cordobas, about 83 US cents. That afternoon was the inaugural Fuego y Agua Beer Mile – not officially endorsed by the race, but it was pretty awesome. I had been following 100k participant Patrick Sweeney’s journey and knew he was the one to beat. Patrick did not disappoint, drinking and barefooting his way to an inaugural course record of 6:30. I was pleased with my performance as I did not puke, nor was I DFL – two firsts for me in a beer mile. Friday started with the Survival Run packet pickup. Normally not too exciting, but this one drew a crowd because, well, it was for the Survival Run so something fun was going to happen. Participants were instructed that in order to get their bibs, they had to swim out to a boat in the lake. Without hesitation, shirts, shorts, and shoes came flying off and they were swimming. After some early excitement that included Yassine Diboun being a lifeguard and swimmers dodging an incoming ferry, the water was cleared within 30 minutes and the Survival Run had begun. The rest of the day included packet pickup for everyone else (uneventful), runners getting their gear and drop bags ready for the race, checking and rechecking maps and course profiles, as well as a nice dinner and beautiful sunset at a beach-side resort. Bed time, but not necessarily sleep time, came early for all, as go-time was 4 a.m.
At 3:45, the survival runners were instructed to pick up their chickens that they were to run with for five miles, the first of their many challenges of the day. The rest of us, 100k and 50k runners, made our way through the dark on the gently rolling terrain. The lead pack consisted of 100k’ers Nick Clark, Yassine Diboun, and Dave James, as well as 50k’er Alex Kurt. I settled into a nice rhythm with Nick Coury, with Jamil close behind. Nick and I chatted about the upcoming 24-hr World Championships, which he had just learned a day earlier he would be representing the US at, as he moved up from his first-alternate position. Somewhere between aid stations 1 and 2, we were running on a sandy road that paralleled the beach and decided it would be nicer to run on the firm sand of the beach, but less than a minute later, we both noticed the fence line curving away from the beach, instinctively looked left and saw a course marker. A few minutes later we caught up to Yassine, who had decided to back off from the fast early pace of the leaders. Soon we came to aid station 2 at the beautiful natural spring pool of Ojo de Agua and while filling bottles, Yassine casually asked how far back we were from the leaders. We were the leaders! Oops. We all knew exactly where the guys had gone wrong and felt bad as we continued along. The next section to aid station 3 was one of my favorite parts of the race. Yassine, Nick Coury, and I ran along the road, with Volcan Concepcion to our right with the first rays of the morning sun just starting to shine upon it, and to our left the sun was just rising above the horizon over the very large Lake Nicaragua. That, in itself, was enough for all of us to comment how incredibly fortunate we were to be right there at that exact moment. Then all of a sudden, a woman on a beautiful white horse gallops by us on the beach. Our jaws collectively hit the road. At just 2.5 hours into the race, the three of us arrived at aid station 3, 31k into the race – pretty decent pace, but also very easy terrain so far. Jamil had caught up just as we arrived, and he and Nick Coury left Yassine and I as they danced over the rocks starting up the first climb of the day, Volcan Maderas. Not much time passed before Dave and then Nick Clark, who’d both gone off course earlier, caught and passed us. Yassine pulled away from me there, too, as I started to bonk from not paying close-enough attention to my early nutrition. Up, up, and up Maderas we went, and we soon found out that this was the “Agua” part of the race’s name. It got muddy. It got sloppy. It got humid. It got jungle-y. It got steep. It got jungle gym-y. It got tight. It got sketchy. It got cooler as we climbed higher. It got to be slow-going. It got really fun. We eventually topped out then slid our way down into the crater. It was cool going into the crater, but that also meant we had to climb back out… which we did, then finally all the way back down to lake level and the 50k finish. Nick Coury was the first runner through 50k, followed closely by Dave, Nick Clark, and Yassine. Costa Rican Diego Mendez was next, winning the 50k in 5:43, with Jamil Coury a minute back for second. Alex Kurt rounded out the top three in 6:22. On the women’s side, Vanessa Desota won handily in a course record time of 7:25, with Laura Kukta, fresh off a three-day stage race in the Andes, finishing second in 8:39, and Jen Burton rounding out the podium in 8:58. This 50k is no joke, especially the last 20k. Ian had biked out to the 50k finish, so it was nice to see a friendly face playing cheerleader. Then it got hot. The route to the next aid station at 62k was mostly road and very exposed under the sun. Thankfully that aid station was, once again, Ojo de Agua, the natural spring pool. I’m quite sure almost everyone jumped in and swam around a bit, providing some temporary relief from the heat (The humidity wasn’t too bad during the race.). The temperature just kept rising the next 20k of mostly dirt and rocky road. Even the smallest inclines reduced me to a walk, as my heart rate would rise with the grade and heat. It was along this stretch that Yassine started experiencing some kidney pain, likely caused from severe dehydration. I was sad to hear of his dropping after sharing the lead with Nick Clark for most of the second half, in this, his first international race, but after hearing his story of why, I’m glad he did. I didn’t want to see my buddy curled up along side the trail in the fetal position because of kidney failure. Jogging into aid station 8 at 82k was a special treat, as we were rewarded with an ice cold bottle of water and a seat in the shade. This was welcome relief for all before our final obstacle to the finish, a big climb and descent of Volcan Concepcion, Ometepe’s active volcano. While a tough climb, not nearly as tough as Maderas. Concepcion is the “Fuego” of the race’s name, and it is definitely hot, dry, and very steep, but the climb was shorter and easier than Maderas, as we couldn’t summit due to potentially dangerous volcanic activity on top. Shortly after reaching treeline, we popped out on a ridge and were greeted by two glorious things: a huge gust of wind and the aid station, the latter of which signaled the high point. It was all downhill from here! The first couple of miles down proved to be tougher than the climb, as the pseudo-trail was extremely steep and sketchy with loose rocks, deep holes, and many animal trails that looked like the main trail. Finally, with about 5k to go, the only remaining obstacles were herds of cows, horses, and an occasional street dog. It was good to be finished. Nick Clark ended up blitzing the 100k in a course record 10:34, Dave James held strong for second in 11:05 (also under the old course record), and Nick Coury rounded out the podium with a great 11:20. The women’s race included just three starters and one finisher, Siebrig Scheeres, in a time of 18:14. There were a total of 21 finishers. Meanwhile, on the other side of the island, survival runners were busy carrying insane amounts of weight, climbing trees, chopping down trees, swimming, putting eggs on their head, digging in the sand, threading 20-foot-long bamboo sticks through the jungle gym, and basically just having fun playing on an island, while at the same time doing chores that were actually beneficial to the locals. 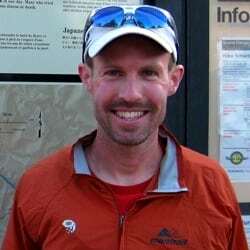 Race director Josue Stephens had originally predicted a 10% finish rate for this race; with 33 starters and just 2 finishers, he was only off by one person. Local Johnson Cruz Barrios beat Junyong Pak to the Survival Run finish, 16:02 to 16:28, noting that the obstacles were like a pretty typical day for him on the island. In the shortest, yet definitely not easy, race of the day, the 25k runners were treated to a leisurely start time of 7 a.m. Their route took them up Volcan Concepcion and back down the same way the 100k finished. Running away from the competition was Anders Samuelson in 2:17. Melvin Cano ran strong for second in 2:24, while Juniors Treminio held onto third in 2:34. Amy Perez continued her winning ways this winter by winning her Fuego debut in 3:10, unknowingly taking the lead with just 4k to go from Silvia Chacon, who was second in 3:15, while Helen Schafer rounded out the podium in 3:22. In the unofficial team category, scoring consisted of a state’s top two runners in the 100k, with a tie-breaker being each state’s highest-placing runner in one of the shorter races. Team Colorado’s Nick Clark and I, first and fourth in the 100k, and Amy Perez, first in the 25k, edged out Team Arizona’s Dave James and Nick Coury, second and third in the 100k, and Jamil Coury, second in the 50k, by just one point. This was one of the most unique weeks of my life. Josue has done an amazing thing in bringing together athletes from two completely different sports. The mostly type-A, strength-based survival runners met head-to-head with the mostly low-key, endurance-based ultra and trail runners. A very strange meeting, and a very rewarding one. It was fascinating to just sit and listen to the survival runners talk about shimmying up trees, running with 50 pounds of firewood for five miles, doing 100 burpees, and even competing in ultra-distance events while wearing wetsuits the entire time. The survival runners said they, too, were in awe while listening to ultrarunners’ tales of running insanely long distances without any obstacles as a rest break. The Survival Run was definitely the varsity race of the weekend. I know athletes from both worlds have new respect for the others, and there are even rumors of a few survival runners wanting to run a marathon or ultra, and possibly even an ultrarunner wanting to try an obstacle race in the near future. Thank you to Josue for making this happen. Full 100k, 50k, and Survival Run results and full 25k results. As other race reports come live, we’ll update this section. Check back! So, uh, who’s in for one of the Fuego y Agua races next year? Any ultrarunners out there tempted to apply their endurance abilities to the ultramarathon-distance survival run? Hooray for team CO! I having enjoyed Nick and Ian’s reports as well as the pictures. Looks like y'all had a great time. I'd love to see a report from one of the survival runners…that sounds like a hoot! Check out survival runner Margaret Schlachter's reports. We linked to them in the "Additional Reports…" section of this article. I think your biceps will hurt from just reading what went down in the Survival Run. Well how did I miss that?? Same way I missed the cairns in the Canyonlands… :) Thanks, I look forward to reading them! I guess I don't get the chicken part. Seems like cruelty towards chickens. They, the survival runners, were actually doing a chore for the locals, in moving the chickens from one village to another. Could this have been done using a vehicle? Of course, but that would take away from the survival runners doing work that actually benefited the locals. Yeah, right. And, I'm sure the chickens loved it. The course record for the 50k is Johnson's not the Tico runner mentioned above. Nice recap Sean! Seeing Sean come in looking no worse for wear than someone who ran ten miles was quite astonishing. I loathe when people talk about themselves in a comment of someone else's report but I am doing it here just to give context. I did the 25k and barely made it through. To imagine doing Concepion after having already 45+ miles is mind-boggling to me. Kudos to all the runners who even attempted this beast. I know I look at it differently as I am horrible in the heat and humidity but nonetheless finishing the race in such a stellar time is something Sean should be quite proud of. Way to go. Great recap of the week. It was a fantastic week and trip. Sean great getting to spend time with you and the rest of the runners. I loved seeing the obstacle world and ultra world collide together. It was fun to share in all the fun! Looking forward to the next installment of Sean's south of the border trip from the Copper Canyon race. Wish I was there! I had a blast hanging out with you, Ian. Thanks for holding the plane for me and for being the official iRF FyA photographer! Wish you were here for the rest of this grand adventure, too, my friend. Hey Sean, just a heads up about the 25k finishers. The local that you are referring to that won the race was Jose Breceno from Ometepe. Unfortunately Jose never registered for the race so his finish did not count, but he still managed to push his way to the head of the pack. Anders was just visiting the island… no connection to Johnson. Amy, as a Survival Runner, I very gently carried my chicken the 5 miles. He was nestled in my arms and was happy as a chicken can be. Fresh air was plentiful, and surely being crammed into a cage with many other chickens does not seem better. I can assure you I witnessed 220 lb men carrying their chickens with the most gentle of touches! I am an avid animal lover…and these chickens saw a lot of love! DJ and Anonymous, thanks for the clarifications. We've appropriately edited the text. Ian, perhaps, then, the better description of your write-up could have been "…which contains frequent imagery of and ruminations on drinking beer"? ;) Glad you had a good trip down there and I hope the heat, humidity, and alcohol healed your knee! Here is my recap too: http://rundavejames.wordpress.com/2013/03/27/fueg… Happy Holidays everyone! Anyone going back to Fuego Y Agua?